The above info came from Momo, and was edited by yours truly (contact me). The image came from ImageShack. Ojamajo Doremi # is the sequel to a series called Ojamajo Doremi. The word "Ojamajo" is Japanese meaning Bother (Ojama) Witch (Majo). 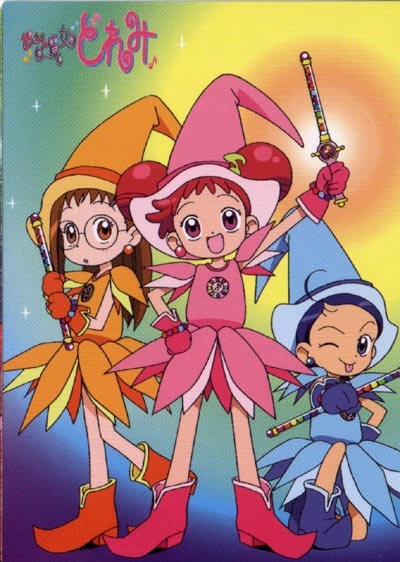 Doremi is a pun of the main character's name saying that she is an Ojamajo. The sharp piece (#) is just another piece off the music pun of the series. In the begining of this second series we start out with our four main characters now with no witch powers (they loose them at the end of season one). When they end up sneaking into the Magical World, they witness the birth or baby witch Hana (Hana means flower in Japnese). Because of this, the Queen re-grants their powers and they are put in charge of Hana-chan. But of course what's a show with a happy ending. Introducing the Flat4, Fugio F, Leon L, Akatsuki A, and Tooru T. The Flat4 group turn out to be a pain because they are trying to capture Hana-chan. But what's this Counterparts: Akatsuki and Doremi both have a thing for each other. Fugio and Hazuki are both so nice and sweet. Poor Leon is always getting beat by Aiko in sports. Also last is Onpu and Tooru. Tooru is jealous because he can't sing (but he can dance). The changes made in this season are: new outfits, new Wands, new shop (it's a flower shop), and a new way to get to the magical world. The above description came from Momo, and was edited by yours truly (contact me).